Dimensions: 15-1/4" x 12" x 5-3/4"
2 Tier Wire Rack, Countertop Spinner, 31"
Basket Display, Countertop Spinner, 31"
Self standing wire counter top racks utilize empty space and increase impulse sales.They are perfect for any small hangable items. Find the perfect rack to increase impulse sales and draw attention. 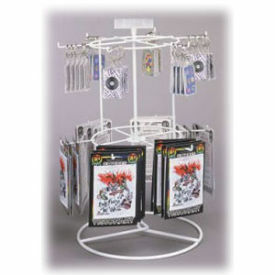 American Retail Supply offers variety of Display Racks for your store. Call us at 1-800-426-5708 for your business needs.